We talked about him before in our blog. He represents many positive traits in Chinese culture; they are thought of intelligent, dignified, optimistic, romantic, sociable, quick-witted, confident, agile, motivators, curious and gregarious. The year before last year, 2016, was a great year to have a baby (as was 2004, 1992 and 1980 and so on..), since they were the year of monkey. Considering we all have monkeys on our minds, it seems pertinent to take a look at China’s most famous literary monkey character: The Monkey King. As the most famous monkey in China, perhaps also in the world, he has different titles: Great Sage Equalling Heaven, the Protector of Horses in Heaven, Wukong (Realize the great nothing) and the Monkey King. 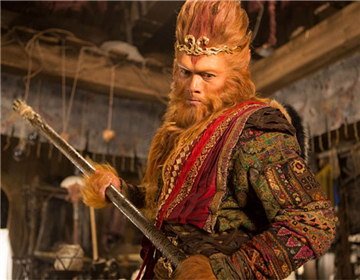 Wukong is one of the main protagonists in the classic 16th century novel, 西游记 (Xīyóu Jì, Journey to the West). The novel follows the legendary pilgrimage of a Buddhist monk to the “western regions” (central Asia and India) and his ensuing adventures and misadventures. Wukong is a playful, curious monkey born with supernatural powers. He grows up to rebel against Heaven in the first part of the book and then goes on to accompany the monk on his long pilgrimage. It’s truly an epic tale! There are four other members in the team: Monk Xuanzang, Pig Bajie, Sha Wujing and the White Dragon Horse. Each of them has their own character. Xuanzang, a devout eminent monk, is the spiritual leader of the team. Bajie the pig isn’t very faithful sometimes and is often attracted by beautiful women, which turned out to be demons who want to eat Xuanzang, so they can turn immortal. Wujing, Monk Sand, is faithful enough but not of very strong power to protect Xuanzang. The Monkey King is capable to protect the team. But his straightness sometimes annoys Xuanzang, especially when he killed the demons who pretended to be common folks. (Xuanzang is a very kind monk believing a man should not kill in any circumstance.) But his loyalty and firm faith eventually lead the team to the destination, after they have gone through 81 hardships. Zhǐyào nǐ xīnchéng zhìjiān, niànniàn huíshǒu chù, jíshì língshān. Yíyè fú píng guī dàhǎi, rénshēng hé chù bù xiāngféng. This basically means, “we will see each other (again) eventually.” It’s appropriate as a phrases for when you’re not sure when you’ll meet (again). In China’s long history, there have been many classical Mandarin Chinese books. Children learning Chinese will love to read the story of Monkey King!